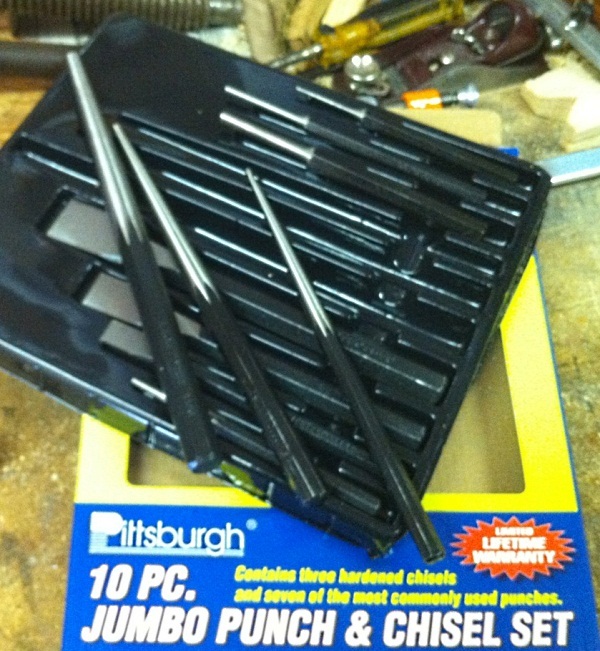 Tonight I made a draw-bore pin from the Harbor Freight punch set I picked up a couple weeks ago. I picked up the idea from the Oldwolf blog that I sometimes read. I put a simple handle on it from some scrap Myrtle I had in the scrap bin. Not much to say that won’t be explained by a few pictures. I did put my saw bench to good use though, which you can see in the next picture. It’s becoming quite handy around the shop, especially as I build my workbench (more on that later). Here is the punch set I picked up. It has at least three that can be used for a variety of sizes for cinching up the mortise, depending on the size of your holes drilled. 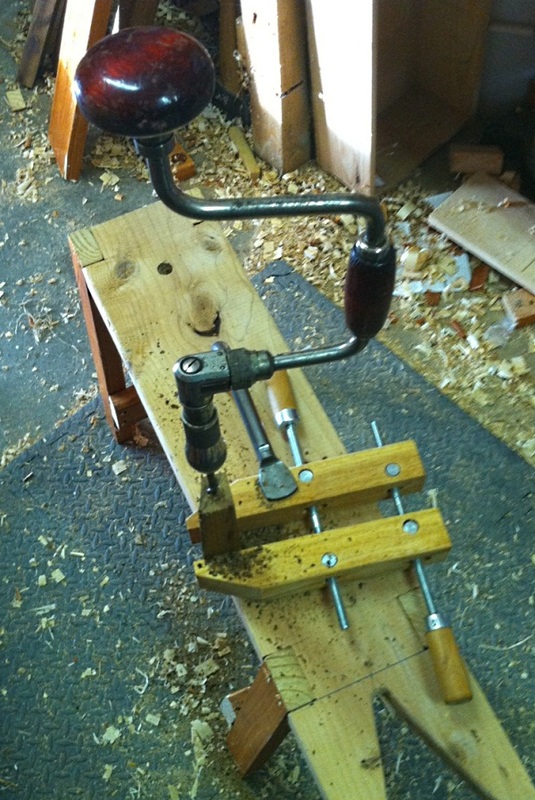 I drilled a hole in the Myrtle wood using my #8 auger bit, clamping the piece in a screw clamp, and using the hold-fast in the saw-bench. Worked quick and easy. I did have to ream out the hole some with a #9 auger bit to get it go in partway. Then I turned the handle on my Lathe (no pictures of that part). The lathe is pretty much the only power tool used in the shop these days, with the possible exception of the cordless drill. I’m enjoying listening to music (Black Sabbath, and Adema for tonight) instead of the table saw, and the lack of dust is a very nice thing. The hole wasn’t exactly straight, so the handle is a little crooked but it’s not a big deal. And if it really bugs me I can always turn another one. The punch is simply pressure fit into the handle, I widened the 1/2″ whole slightly so it slid in most of the way, and then hammered it in the rest of the way. In use it doesn’t get a lot of pressure, so this will be fine. It took probably half an hour to make all told. Now I just need to start chopping some mortises. 🙂 Here I go again building things to make things instead of actually MAKING things. I guess I just have to build up the tools and techniques before I can get started. Something like learning to crawl before I can walk or something. Which my son did really quickly, and didn’t crawl for long at all. Maybe there is hope?